Austria's government has said it may disband a far-right group that received a donation from the main suspect in the New Zealand mosque attacks. The suspect, Brenton Tarrant, also visited Austria on a European tour late last year, the government confirmed. Chancellor Sebastian Kurz said the government was investigating whether the Identitarian Movement Austria (IBÖ) was a "terrorist organisation". Mr Tarrant gave the IBÖ about €1,500 (£1,290), prosecutors say. 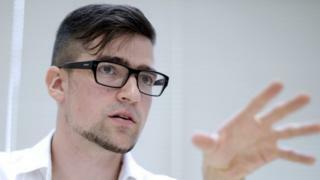 The group's leader, Martin Sellner, confirmed the donation but denied any ties to the suspect. He visited Austria from 27 November to 4 December last year, Austrian Interior Minister Herbert Kickl said, adding that Mr Tarrant's possible links with Austrian extremists were being investigated. The Christchurch suspect arrived in Austria from Hungary and later travelled to the Estonian capital Tallinn, covering 2,000km (1,243 miles) in a hire car, Mr Kickl said. Mr Tarrant had also visited North Korea in 2014 in a tour group including three Austrians, Mr Kickl told Austrian MPs. Earlier Chancellor Kurz said "we can now confirm that there was financial support, and so a link, between the New Zealand attacker and the Identitarian Movement in Austria". "Our position on this is very clear, no kind of extremism whatsoever - whether it's radical Islamists or right-wing extremist fanatics - has any place in our society," he said. Mr Kurz's own conservative Austrian People's Party is in coalition with the far-right Freedom Party, making Austria the only country in Western Europe with a far-right presence in government. Freedom Party leader and Vice-Chancellor Heinz-Christian Strache said on Wednesday that his party had "nothing to do with the Identitarians". The Identitarians are a pan-European far-right movement hostile to multiculturalism, claiming to "defend" white Europeans against immigrants from Africa and the Middle East. In 2017, they helped charter a ship to stop migrants crossing the Mediterranean from Libya. They have spread a conspiracy theory on the web known as "the great replacement", which sees immigrants as a threat to "white" Western culture. That theory was in Mr Tarrant's "manifesto". He also made numerous references to 1683 - a symbolic date for Identitarians, as the year when Ottoman Turks were defeated at the gates of Vienna. Demographic data disproves the notion that non-European immigrants could turn white Europeans into a minority. In a video posted online on Monday, Mr Sellner said he had received an email containing a "disproportionately large" donation from a person named "Tarrant". He said he had sent a "thank you" reply as he did with other donations. "I have nothing to do with this terror attack," Mr Sellner said, arguing that his organisation was a peaceful anti-immigration group. Austrian authorities confirmed last week that Brenton Tarrant had visited Austria, reportedly in November, although details of his stay there are unknown.